Scarlet Benoit’s grandmother is missing. The police have closed the case and everyone thinks her grandmother was an odd ball anyway and no one cares. The only person Scarlet can turn to for help in tracking her grandmother down is Wolf, a streetfighter who Scarlet isn’t sure she can trust but they can’t help but find themselves drawn to one another. As this is a sequel, there may be some vague spoilers for the first book Cinder but I’ll try to keep them to a minimum. Scarlet is a great character, she’s hot-headed and easy to anger but is also incredibly loyal and brave. She balances out well with Wolf as while they’re quite similar, he tries to keep his anger and aggression bottled up so he’s always a bundle of energy. As you may know, I’m not always a fan of romance subplots but I really liked how Scarlet and Wolf’s relationship was handled. There is an attraction between them but they both know that they can’t necessarily trust each other and there’s always the worry about any lies that could come between them. 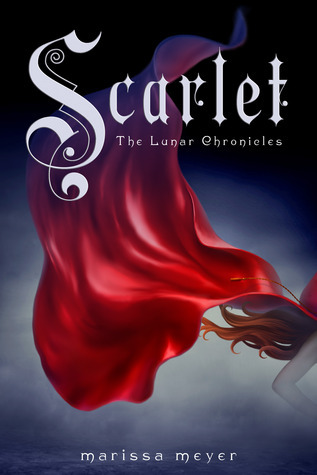 In Scarlet you do still follow what’s happening with Cinder and Prince Kai, and though the book’s focus is definitely on Scarlet, it’s great to see what characters we’ve already met and know are now doing. Also with Cinder you meet Captain Thorne who is definitely my favourite character in this series. He’s loud and brash and thinks he’s more charming than he really is and sometimes he really doesn’t seem to know what’s going on but he’s still coming along for the ride and helping Cinder when he can. The world building in this series continues to be really good. In Scarlet a lot of the story is set in France with the finale in Paris and along the way you learn more this world’s history and previous conflicts including the Fourth World War. It makes the story feel richer and is another way to show that certain characters are like how they are because of the environment they’ve grown up in. Threads from Cinder are coming together in Scarlet and it’s great seeing how these characters who are all over the world and often very different are slowly starting to meet and connect. It makes the world of The Lunar Chronicles feel bigger and as if just about anything could happen next. Scarlet is fast-paced, features great characters and with the way the story is progressing I can’t wait to see what happens next. 5/5. I definitely think Scarlet is my favorite of the three books. You’re right about the romance subplot being good instead of distracting or worse boring. On another note, I’ve nominated you for the Siblinghood of the World tag. Feel free to ignore the nomination if you don’t feel like doing it or already have! It’s a bit slower than the first two books. For me at least. And no problemo!